Since the earthquake of January, 2010, Haiti has increasingly become a target of extraction and private business development by Haitian and foreign investors. Income and trade – if the wages are livable and the trade is fair – would, of course, be helpful for the poverty statistics-topping nation. This would be especially important for the majority of the population who survive on agriculture. However, much of the new business is being planned or executed on lands those farmers’ families have lived on since they were enslaved, leaving them landless and without livelihood. 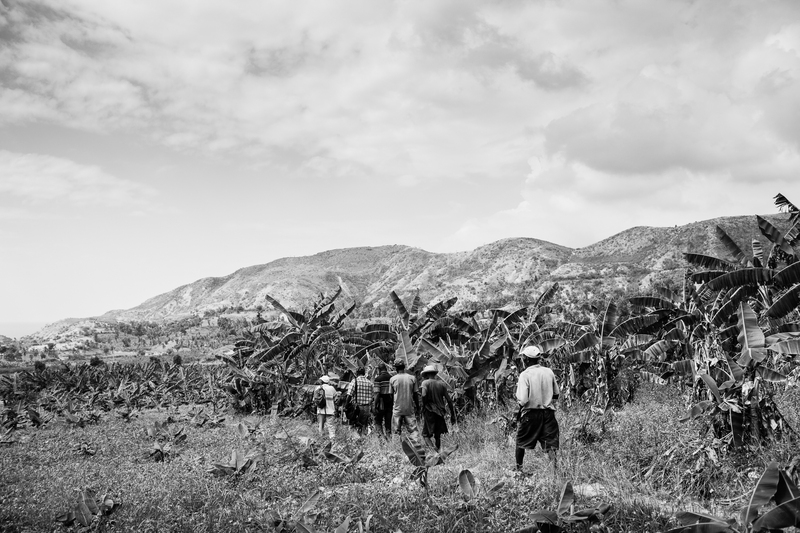 This article debuts a new series, “Land Rights and Food Sovereignty in Haiti,” to run every other week. The series will feature interviews with those directly impacted, investigation by scholars and other experts, and analysis from Haitian activists. The pieces will examine the problems; the role of the US and UN; and solutions, spotlighting food sovereignty. Members of a peasant organization heading to community meeting to discuss their rights. Photo: Roberto (Bear) Guerra. We understand the pretext for this so-called development. The concept of extraction isn’t very well known in Haiti, but the country has had a long history of pillaging by colonial and imperial powers. There is a massive transfer of public resources being planned, from collective to private property. Public funding that should be spent on the population is being used to facilitate business investment. This happened in the construction of the free trade zone in Caracol, in which funds from US Agency for International Development and the Inter-American Development Bank that should have been spent on the Haitian people were instead used to develop private business. When corporations arrive in countries like Haiti – where extreme poverty is so prevalent – they cast a spell on the people by promising a brighter future. When people don’t know what the consequences may be, they tend to welcome any proposal for potential progress. However, once the development projects begin, the promises start to break. That’s when people begin to resist. They protest, they try to bring the companies to court, and they go on the radio to denounce what’s going on. That’s what is happening right now in Haiti. We’re working on alternatives and we are leading a concentrated resistance movement against this model of development. The extractive corporations that have arrived in the country generally employ one of four strategies. The first is the mining and drilling of Haiti’s mineral and [possible] petroleum resources. The government has said that mineral extraction will be a principal development strategy in the pursuit of being seen as an emerging nation in 2030. Currently, the Northeast, Northwest, parts of the Artibonite Valley, and the Central Plateau are undergoing mineral exploration. The amount of water a company uses to mine for gold for one hour would last the average Haitian family of 7-10 people 20 years. A region in the Northeast, with one of the heaviest concentrations of mines, has been under exploration for the last 10 years. This area is now experiencing a severe lack of water, which is no coincidence. Forced expulsion to get at the land under peasants’ feet is also a threat of mineral extraction. Petroleum is another natural resource that companies are looking to extract. According to the petroleum companies’ figures, the petroleum contracts in the Northeast region could be worth over $20 billion. They also estimate that the petroleum riches actually dwarf the mineral riches of the country. The second strategy [which has historically created poor working conditions and unfair wages] is to take advantage of free trade zones. Manufacturers have done this since the 1980s when industries were looking for countries to move their operations to. They saw Haiti as an ideal fit, due to both its geographic proximity to the US and cheap labor. A Haitian worker makes less than five US dollars a day and there are no laws protecting workers. The rampant poverty means that the overwhelming majority of the population are starved for work. According to the government, 35 to 40 free trade zones, mainly for textile companies, are set to open in the near future. The third strategy is tourism. This development plan includes many large hotels, nightclubs and businesses. The scale of tourism development currently being planned in Haiti is unheard of. For the first time ever, we have a Ministry of Tourism. Who stands to benefit? The businesses being lured here. Who will foot the bill? The peasants living on the land who are being dispossessed in the process. A catastrophe in tourism development is set to take place on Ile-à-Vâche, an island with 20,000 inhabitants who live off of agriculture, animal husbandry, and fishing. The state wants to appropriate almost 45 square kilometers of land where the government is planning to build an international airport, just as they are in Les Cayes. Petrocaribe funds are helping to create the infrastructure. Near Ile-à-Vâche are the towns of Cotes-de-Fer and Aquin, where almost $300 million is being invested by the Punta Cana Group to draw tourists to Haiti’s coasts. In 2014, all of the housing along the shores of Port-au-Prince was demolished and there are similar projects underway in Cap-Haïtien, Môle-Saint-Nicolas, Savanne, Jacmel and Ile de La Tortue. Much of the coast has been snatched up by eminent domain and designated as a free trade zone for tourism development. The fourth strategy is agro-exploitation. Large North American and European corporations have deemed that Haiti has a comparative advantage in products that Haitians don’t need. This model just doesn’t make sense for Haiti, a country that is heavily dependent on its food resources. Resistance is only effective when it’s part of a larger movement with clearly stated goals and plans for achieving that change. Organizations are beginning to form and discuss these issues on a regional level. We’re asking people, “What would make your lives and your livelihood better?” In the Northeast, where they produce rice, we’re asking people what they need to produce more and involve more people in the production process. If more rice is produced, more Haitians will eat. Why plant bananas and sell them elsewhere? Why produce textiles to sell overseas? We’re asking these communities what they want and how they want to develop. We haven’t arrived at a consensus yet, but the ball is already rolling in communities throughout the country. We hope that people will continue to cooperate, organize, and work on alternatives to these destructive projects. We have collaborators working with us on these problems internationally, notably in areas of Latin America. We hope that others will join us in intensifying the battle, because it’s the same fight all over. The struggle for land justice knows no borders. It’s up to us to unify and fight this battle together. With thanks to Nathan Wendte for translating this interview, and to Roberto (Bear) Guerra for use of his photo. Copyleft Other Worlds. You may reprint this article in whole or in part. Please credit any text or original research you use to Other Worlds.